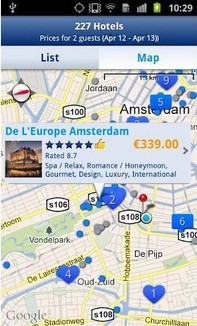 Booking.com - 330,000+ hotels app. The booking and reservation app from what is probably the biggest booking site on the world with arguably the largest hotel, hostel, apartment and even more kinds of accommodation, this app has almost everything that one needs to make a reservation quickly, even while on the move, and manage it including check in and notification, everything done simply with the Booking.com app. The app itself aims for simplicity, with as few buttons as possible, just the searching button, filtering and sorting and then going over the hotels themselves, seeing their reviews, photos and scores. Everything you need to make an educated accommodation choice. The booking.com account allows you to sync and manage your reservations on the Booking.com app, on a desktop and on the website itself, complete with checkin and notifications. Naturally, we did have some small issues with some things. It seems Hotels.com has more last minute deals and promotions, though at this time we have yet to perform a comparison between the major booking apps. We would have liked to be able to review the hotel we're staying in right from the app. After the last update one of our testers could not open the app and he had to uninstall it and then download it again from Google Play. Another made a reservation that turned to not exist - to this day we're not sure if the problem was in the hotel, Booking.com app or the tester himself made a mistake. Score: A 5 out of 5, because of all of our testers found it easy to use, liked the map and it delivered exactly what it offered. Description: A hotel booking and reservation app that builds on Booking.com extensive hotel network to provide the users a huge amount of hotels and other kinds of accommodations to select from. Including notifications, searching and filtering, map orientation and reservation managing, this is one of the best booking apps on Google Play today. Good Points: Our testers liked the map, seeing all the hotels relative to their location. We also liked the simple interface, the amount of hotels available and the reservation notifications, which were very useful. Of course, seeing so many pics of the hotels to select was also great. Bad Points: We didn't like the fact you cannot review a hotel from the app. Since you book it from the app, and you carry your smartphone with you all the time, why not let the user write a review right there on the spot? And as is the case with so many apps, we did encounter some problems after the last update. Experience: Again, disregarding the update, the app worked almost flawlessly on almost every smartphone. Our testers found it easy to use and liked the ability to flick through images of the hotel they were interested in, including pics of the rooms. All in all, all agreed this is a superb booking app.